In recent years, due to peopleâ€™s increasing awareness of environmental protection, many countries have successively promulgated laws and regulations concerning the control of volatile organic compounds (VOCs). Therefore, the reduction of the use of solvents or products without the use of solvents has attracted increasing attention. Waterborne polyurethane (PU) has developed in this situation. In addition, the advantages of water as the medium are non-toxic and non-polluting, and the waterborne polyurethane has been widely used in the field of paints and adhesives, and has gradually replaced solvent-based polyurethanes. Nanjing University of Chemical Technology successfully developed a new type of nano-polyurethane emulsion, and successfully completed the industrial scale test. The product performance indicators have reached the level of similar foreign products. Waterborne polyurethane has been widely used in tanning industry, textile industry, coating industry, printing industry and construction industry due to its unique and excellent characteristics. It has gradually penetrated into the application field and become a new important part in the material industry. Polyurethane latex leather coating overcomes the shortcomings of hot and cold brittleness of acrylic resin finishing agents, and has obvious advantages in chemical, abrasion resistance, flex resistance, elasticity and other comprehensive properties. In developed countries, polyurethane emulsion leather finishes have basically replaced traditional acrylic leather finishes. The wood industry is the main application area of â€‹â€‹polyurethane emulsion adhesives. Traditional wood industry adhesives are generally urea-formaldehyde resins, phenolic resins, and melamine-formaldehyde resins. Before using these glues, it is required to dry the wood to reduce the moisture content and to generate formaldehyde during the operation. The pollution is serious. The polyurethane emulsion can overcome these shortcomings, and is superior to polyvinyl acetate in hydrolysis resistance and heat resistance, and can be used for laminating, manufacturing of particle board, and composite of wood decorative film. Coatings are a major application area for polyurethane emulsions. In addition to furniture lacquer, electrophoretic paint, electrodeposition coating, architectural coatings, paper coating, glass fiber coatings. Water-based polyurethane can be used dyeing auxiliaries, paint printing adhesives, soft and wrinkle-free finishing agents, anti-static and hydrophilic finishing agents, etc., to improve dyeing depth, fastness and other properties of textiles. Polyurethane emulsions can be used as cement admixtures to increase the strength and water resistance of cement. To 1,000 tons / year, 20% solid content cost: 5,000 yuan / ton, the price of yuan / ton. Annual production value of 1000-1500 million yuan, profits and taxes 500-1000 million. 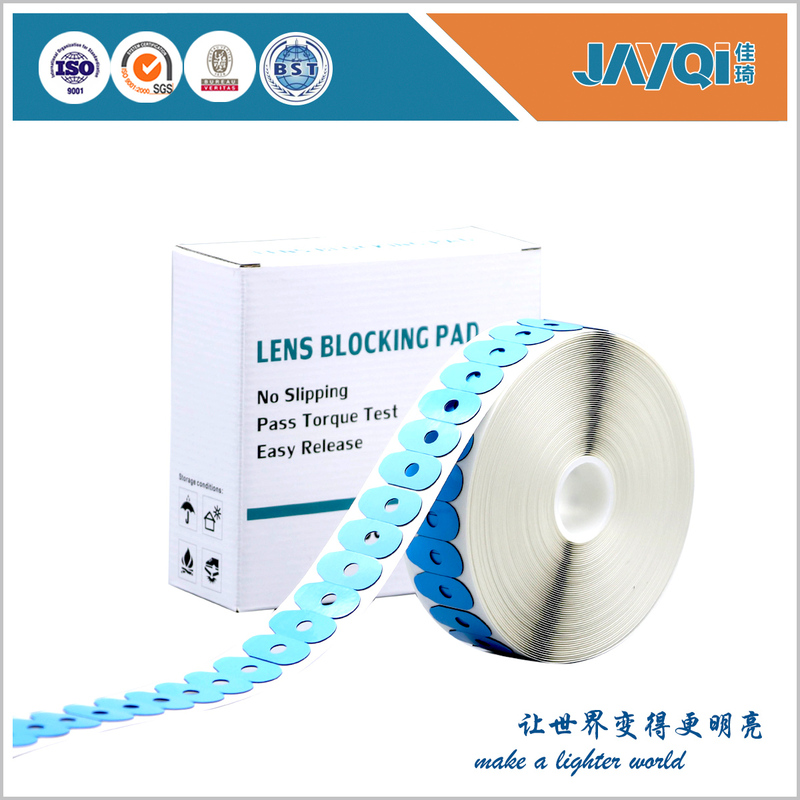 The Standard Lens Blocking Pad is made of quality adhesive materials which can help to create the best slip resistance. It is firm to adhere to optical lens during edging. Meanwhile, easy to remove from lens without residue will not scratch the lens and save the working time. All the Lens Blocking Pads have passed the test of torque. We have various sizes fitting for different edging machines.